When Olympic medals, World and/or Supercross titles are on the line, this is the line they’re talking about. The Straight-8 BMX starting gate by Pro Gate is the world standard for Elite racing. 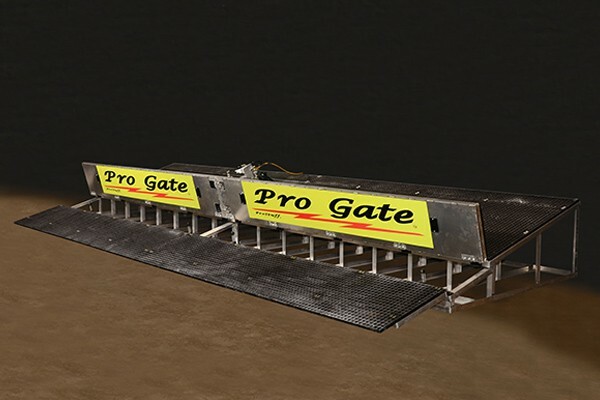 Whether it’s moving from stop to stop on the UCI BMX Supercross World Cup tour, or a permanent installation, race promoters and track developers rely on the unparalleled design, workmanship and service that is “baked-in” to all Pro Gate products. Each system is built to order, using UCI specs, and your site plans. Then, it is fully assembled and tested in our Rockford, IL facility, before shipping off to report for duty on your starting hill. The gate structure is paired up with Pro Gate’s ram and starter controls to complete the “system.” Popular options include speakers, additional light trees and timing systems. Our “Gatekeeper” maintenance products keep everything running to factory spec. When it’s time to ship, Pro Gate packs, crates and arranges shipping by road, air, and/or sea, handling all the details of getting your Straight-8 from point A to point B. Pro Gate personnel can also be on-site for the installation and to train your team on proper operation and maintenance procedures. Call today, or complete the form below for the “straight” scoop.